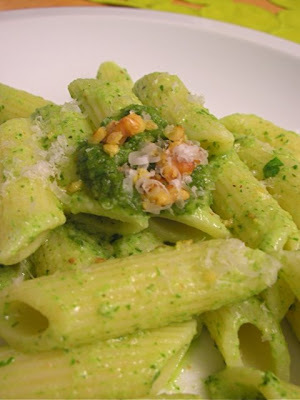 ShowFood Chef: Carrot Top Pesto? You Must Be Joking. Carrot Top Pesto? You Must Be Joking. After carefully turning over several bunches of carrots at the Farmer's Market, you finally choose the brightest orange/purple/white/green ones that "speak" to you. Then, just as you're reaching for your money, the busy bagger says, "you don't want the top greens, right?". And you answer....."YES, I DO want the top greens. " Or at least in the future maybe you'll answer that way. I grew up next to my grandparent's survival farm in North Carolina (a long way from California where I live now.) My grandparents used every last morsel of everything they raised, planted, or caught. That included frying the weirdest parts of unlucky possums (even I can't go that far.) They would not have thrown away any greens from anything. The greens would have been used as seed, feed or filler. With that spirit in mind, I have been on a quest to find ways to use carrot top greens and one of the more successful uses is Carrot Top Pesto. But what about the carrot greens? According to the Carrot Museum (who knew? 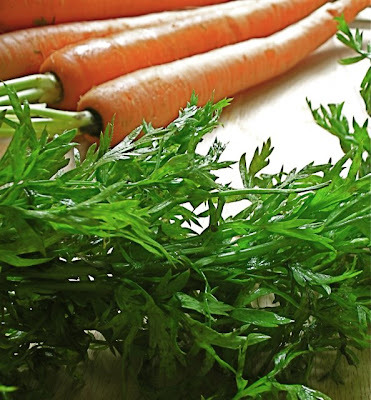 ), these feathery greenies contain a crock full of Vitamin K which the actual carrots don't even have. Not to mention Potassium AND...Chlorophyll which combats tumours, cleanses our blood and glands and even heals injuries. Years ago, folks would chew on the carrot greens as a breath freshener which is nice since they didn't take a bath except for once a month-- so at least something was clean. Besides this pesto, you could throw carrot greens into your next smoothie for a boost, chop some and sprinkle over a salad for a spicy/bitter edge, or even boil the greens and strain to make a tea (that one took some honey for me.) Make the most of everything you got, right? Carrot Top Pesto is all about that. In a saute pan, heat 2 tbls of the olive oil over med. heat. Add the onions and loosely chopped carrot greens. Heat the greens and onions just til wilted (about 2 minutes). Remove from heat and let cool for a few moments. Serve over prepared pasta, as a garnish for soups, or as a sandwich spread. Keep in container in refrigerator for several days, or freeze for several weeks. Send me pics of how you used the Carrot Top Pesto. Enjoy! That is brilliant! and i think I would have been a fan of carrots sooner in my life had they been called "root-Popsicles". Genius.